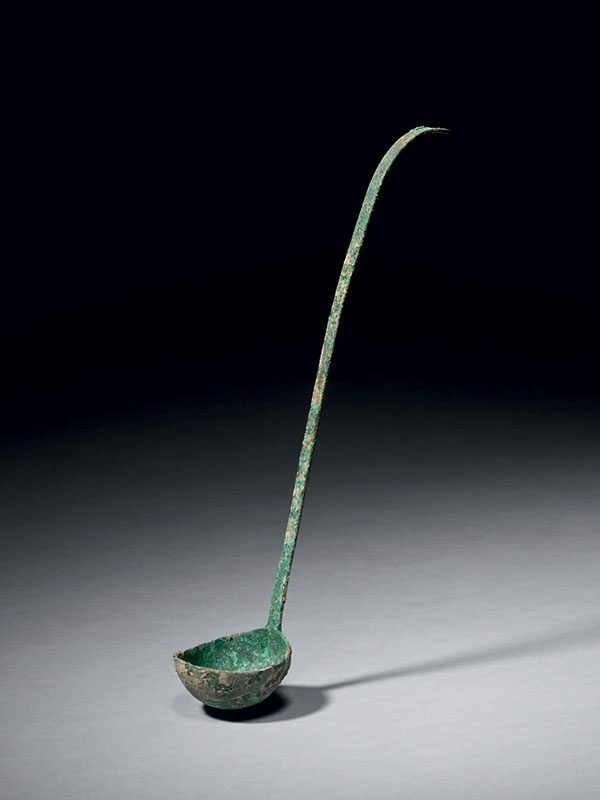 A small bronze ladle with a boat-shaped bowl and a long, gracefully curved handle. The ladle is entirely undecorated and is covered in a green patina that has malachite inclusions all over. This relatively small, elegant ladle forms part of a group of wholly and deliberately unadorned bronze pieces made for Buddhist monks for use in rituals. It was probably made to transfer water from a larger to a smaller vessel. Many such vessels and utensils ended up in Japan, where they were revered but also used in Buddhist monasteries. A similar, somewhat larger ladle was included in an exhibition of Chinese Tang dynasty metalware at the Kuboso Memorial Museum of Art in Izumi, Japan in 1999.